The 2015 Skills USA Championships took place June 22 through June 26 in Louisville, Ky. and hosted over 6,000 career and technical education students. 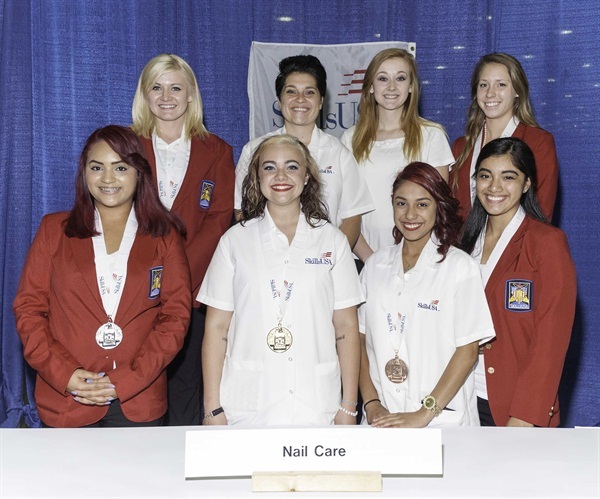 The Nail Care Technology Contest is one of the 100 competitions offered at the conference and assesses each competitor’s preparation for employment and recognizes their professionalism in the field of nail technology. Winners are chosen through evaluation of oral communication skills; application of acrylic, tip and wrap, and nail polish; nail art; pedicuring and a written exam. The competition in divided into college-level and high school-level students. For the college division, the gold medalist was Briana Knackstedt from Centralia, Ill. The silver medalist was Amy Sayler from Oberlin, Ohio and the bronze medalist was Cassidy Bell from Chattanooga, Tenn. The high school division’s first place winner was Alex R. Stapleton from Blountville, Tenn., followed by Natalie Carmona-Garcia from Little Rock, Ariz. in second place, and Cynthia Gonzalez from Mission, Tex. in third place. The national technical committee for the Nail Care Technology contest, which was also assisted by a national education team, consisted of six members: chair Teresa Lewis, OPI Products Inc.; Lynda Anderson, Your New School; Mandy Burton, Pivot Point International Inc.; Clarabelle Hern, Custom Nail Technology; Danielle Klahr, Milady, a division of Cengage Learning; and, Judy Sheils, OPI Products Inc.
Other organizations that support this competition include Aloxxi, Belava, Burmax Company Inc., Footlogix, Le Chat Nail Products, Lowe’s Companies Inc., Marianna Industries, Medicool Inc., Premium Nails, Tammy Taylor Nails, and Xenna. In addition to the Nail Care Contest, the conference has a cosmetology contest, as well as contests completely unrelated to the beauty industry, like technical computer applications and firefighting. For information on how to register students for next year’s conference event, visit SkillsUSA.